Notices for upcoming public hearings, meeting and Development Services reviews are listed below in Adobe Acrobat format. Clicking on the address/project listed below will open the notice. Some notices will consist of multiple pages. For more information on current development projects you can go to the Current Development Projects web page. Amendments to Title 10, Chapter 4, Section 12: Accessory Dwelling Units (ADU) of City Code necessary to be consistent with State Statutes Adopted in 2017 (SB 229 & AB 494). 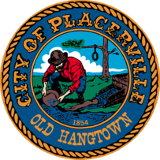 Hangtown Creek Water Reclamation Facility Clean Water State Revolving Loan Solar Photovoltaic Facility (Link to: Initial Study / Environmental Checklist and Mitigation Monitoring Program). TUP 18-01 has been put on hold per the request of the applicant and will not be heard on April 17, 2018.
to Planned Development Overlay (PD) 06-01). Conditional Use Permit (CUP) 15-03; Site Plan Review (SPR) 15-05.